August 1999 photo by David Bangs. This rare Ginkgo tree was planted by Dr. W.E. Gibson (a physician) at the start of the twentieth century. Dr. Gibson became Issaquah’s mayor in 1900 and served several additional terms as mayor and in the state legislature over the next 25 years. 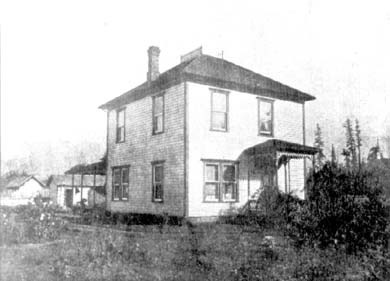 His family home was located on this site until it was torn down in 1970. Fortunately, through the efforts of Issaquah High School Students, a petition was drawn up and the tree was saved. Ginkgo trees belong to one of the oldest tree species on earth (Ginkgo biloba), dating back 150 million years. They were once native to Washington but later became extinct in North America. Specimens cultivated in Chinese ornamental gardens were later reintroduced around the world. Ginkgo trees (Ginkgo Biloba) are one of the oldest tree species on earth, dating back 150 million years. They were once native to Washington, and until the late 1700s were thought to be extinct. Specimens found in China have since been introduced around the world. 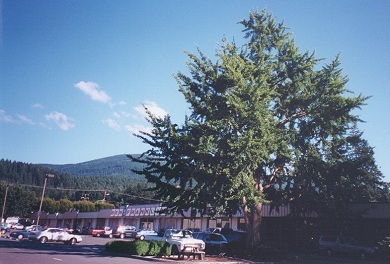 In August 1999, a marker table was placed under the tree along with a plaque explaining its history, courtesy of Main Street Issaquah, The City of Issaquah, the Gibson Family, Swanson Arch. Grp, Baima & Holmberg and Morris Piha Mgt. Grp. Based on our records, the historical society believes that several facts listed on this plaque are incorrect. Most notably, Gibson was not the first mayor of Issaquah. He did become mayor briefly to fill an unexpired term in 1900 – less than one year after the name of the town had been changed to “Issaquah” and he went on to serve additional terms as mayor in later years. However, the town’s first mayor was Frank Harrell,who was elected in 1892.